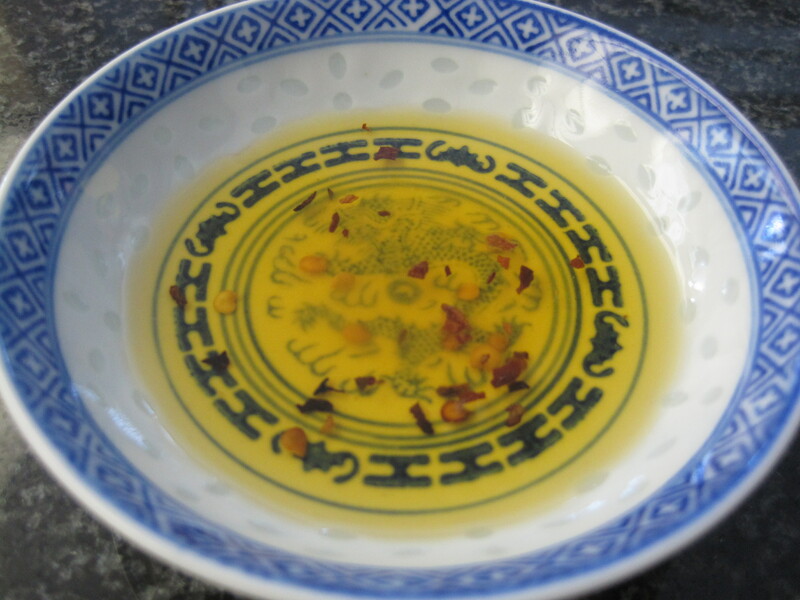 Chinese hot chili oil is versatile, delicious, and cheap and easy to make. Use this as a condiment (e.g. for dumplings), use it in sauces (see bang bang chicken recipe here), soups (hot and sour soup recipe here, Chinese borscht (lor sung tong) recipe here), add this to a noodle dish (even instant noodles), or use it as a substitute for cooking oil to add heat to any dish. Normally, this is made using whole, dried red chilies, which gives the hot chili oil a red colour. However, I happened to have a lot of red chili flakes on hand, so I used that instead. Place the dried chili flakes in a glass jar. In a wok over medium high heat, heat the oil until it starts to shimmer. Immediately remove the wok from the heat and allow it to cool slightly, about 3 minutes. Then carefully pour the hot oil into the glass jar with the dried chilies. Stir and allow the oil to cool completely. You can keep the chilies in the oil or you can strain the chilies out of the oil. I prefer to leave the chilies in my oil because I use a low ratio of chili flakes to oil. The longer the oil sits with the dried chillies, the spicier the oil will be.